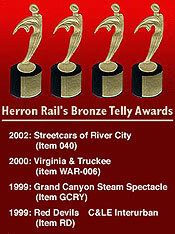 Thank you for stopping by Herron Rail Video. Please browse a bit and look through our extensive catalog of beautiful American and Foreign railroad videos as well as traction and steamship videos. We also have an large image section featuring Diesel & Electric Locomotives, Steam Locomotives, Passenger Trains & Cars, European Railroads, IC / ICG Images, and our favorite, images from the L&N Railroad. When you are ready to order you may place your order through our secure on-line store, use our toll free ordering or FAX us your Herron Rail Video order. Want to see how we produce our videos and learn about the equipment we use... then check the About Herron section. Need stock footage for a video, television or movie production? Look over our Stock Footage section. We're open 24 hours a day 7 days a week to serve you, the discriminating railroad historians and enthusiast. Quality. The difference is on the screen.